Three people have been killed as the Donbas militants have shelled the town of Avdiyivka, the Ukrainian Interior Ministry department for the Donetsk region reports. The shelling of residential neighborhoods in Avdiyivka started at about four o'clock in the morning, the department said. A 73-year-old woman and her disabled 10-year-old son were killed as a projectile hit their apartment on the 8th floor of an apartment block, it said. A 49-year-old man was killed as a projectile hit a private house on Sportyvna Street, causing its roof and walls to collapse. Acting chief of the Avdiyivka town police department Anatoly Kovalchuk said some other buildings were also damaged. A criminal case has been opened into the incidents under Ukrainian Criminal Code Article 258 Part 3 (terrorist attack). Viacheslav Abroskin, the chief of the Ukrainian Interior Ministry department for the Donetsk region, had said earlier that a woman and her grandson had been killed as militants fired upon Avdiyivka. The press center of the military operation in southeastern Ukraine had said in an earlier statement on its Facebook account that militants had fired upon Ukrainian government forces' positions about 60 times over the previous 24 hours, including more than 20 times using weapons banned by the Minsk agreements. In particular, militants started firing mortars upon Avdiyivka from Spartak at 9:00 p.m. on Friday, it said. 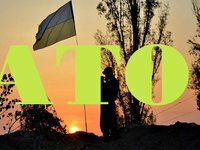 Ukrainian government forces' positions were also shelled in the area of the communities of Opytne, Novotoshkivske, Avdiyivka, Pisky, Verkhniotoretske, Vodiane, Pervomaiske, and Novotroyitske, it said. Militants have used 122-mm artillery guns six times, 120-mm mortars 29 times, and tanks three times over the past 24 hours, it said.